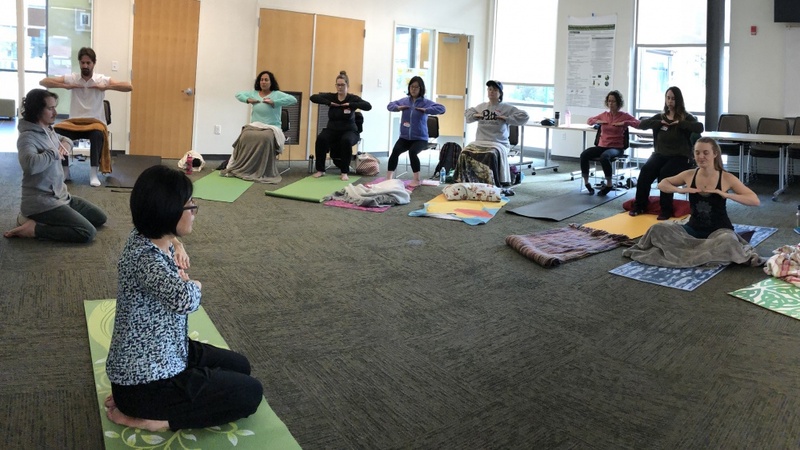 Members of the University of Oregon community can fight the midwinter slump and arm themselves with an arsenal of relaxation techniques at an upcoming SKY Happiness Retreat. The retreat is a 14-hour event held over the course of three days beginning Feb. 15 and will serve as an opportunity for participants to manage stress, build character and learn breathing techniques. SKY at UO is a new campus club that helps students balance various aspects of life through yoga, breathing and meditation techniques. The retreat will help participants learn to manage stress, build character and develop leadership skills, according to SKY at UO president and doctoral student Ting-fen Lin. “It’s a very precious program that brings about that inner peace,” Lin said. Lin brought the program to the UO after participating in the retreat during her master’s program at Ohio State University. The retreat will take place in Room 144, HEDCO Building and will cost students $75 with a scholarship program or $195 without. Nonstudents can also participate in the multiday retreat for $295. SKY stands for Sudarshan Kirya Yoga, a breathing-based mediation practice created by Sri Sri Ravi Shankar and supported by the International Association for Human Values­­, a nongovernmental organization that supports programs of personal development, according to the SKY website. Since SKY’s conception, the retreat program has grown to more than 40 campuses across the country, including Stanford University, University of Southern California, Massachusetts Institute of Technology and Purdue, Lin said. In a statement from last year’s retreat that was provided by SKY at UO, Stacy Warnick-Hesse, then a second-year communications disorders and sciences master’s student said, "The happiness retreat turned out to be more than just a tool — it helped brighten my whole outlook on people, challenges and life. While I had initially felt apprehensive of spending a full weekend at the retreat — during a time when I felt every minute should be devoted to working — I am deeply grateful that I made this investment in myself and my well-being." SKY at UO also holds free weekly breathing and meditation sessions every Monday in Room 225, Friendly Hall from 4 to 5 p.m. Students can learn about the techniques that will be explained in more detail during the retreat. The three-day retreat will be held Friday, Feb. 15, from 6 p.m. to 10 p.m. and Saturday and Sunday, Feb. 16 and 17, from 11 a.m. to 4 p.m. Attendance to all three sessions is mandatory for those who sign up. To learn more about the SKY Happiness Retreat or the SKY at UO club, visit their Facebook page.